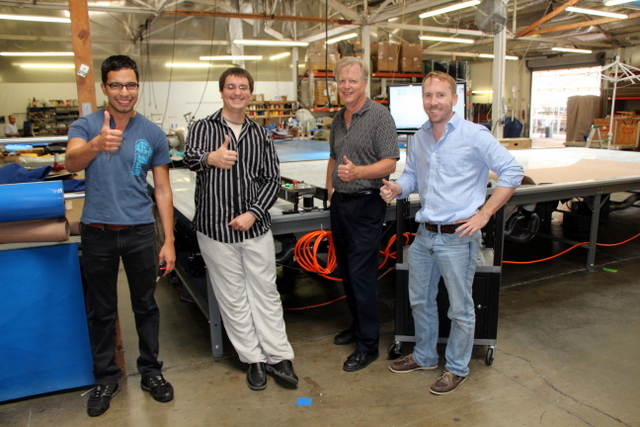 Carlson Design recently installed a PTi-126″ Plotter/Cutter at Academy Awning, a Los Angeles based company with over 100 years experience making awnings and canopies for some of the most well know landmarks and fortune 100 companies in L.A.
What sets Academy apart from the competition, according to vice president Michael Richman, is that, “we are a sales and marketing driven company”. With the help of CAD programs likes Solidworks and AutoCAD, they can produce exact renderings of each project before manufacturing begins. This helps with estimating, improves the customer buying experience, and sets expectations for the finished product. Prospect quotes are easily saved and customer jobs are stored for re-cuts and recovers. 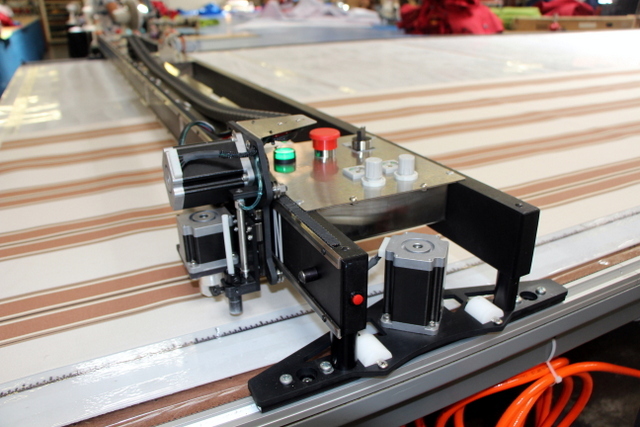 Academy Awnings purchased a Carlson Design Plotter/Cutter to “marry” the skills and expertise of their experienced manufacturing team with their knowledgeable and technology driven sales team. To do this, they hired two young (under 30) CAD designers, Travis and Ricardo. While CAD, computers, and machine operation are easy for Travis and Ricardo, until we installed their plotter/cutter they had only been drawing layouts for the weld shop. 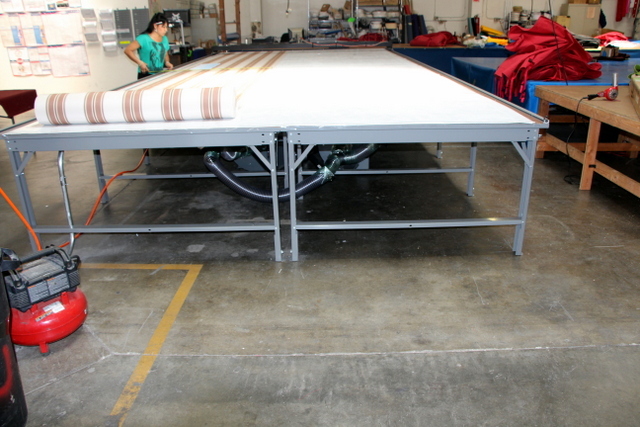 They had little or no experience designing, measuring, marking, and cutting the fabric for awnings and canopies. So, how do they learn what to draw and send to the plotter/cutter?? Meet Maria: With over 20 years of experience making everything from traditional awnings to complex canopies with stripes, wrap-arounds, and unusual angles — measuring and marking cut and sew lines is second nature for her. 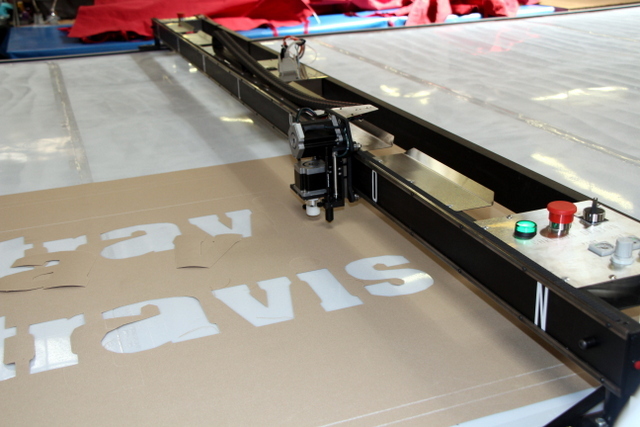 When Travis learned his lack of knowledge concerning seam allowance, wrap, drop, and stripe matching were his bottleneck to fully implementing the plotter/cutter, he immediately asked, “What time does Maria arrive every day?”. 5AM! “OK, I’ll be here at 5am, learning everything I can!”. Maria shows Travis how to make an awning. Drawing on the computer is much more precise and it gives you the big picture before you make your first cut. This means many calculations that are done manually or on-the-fly, like stripe matching, must be calculated in advance. At first this is challenging for Maria and Travis. Maria must go through the entire process before she starts — something she usually does from memory as she goes. Travis must understand the advantages and limitations of CAD and the plotter/cutter enough so he can ask Maria the right questions. Often it’s hard to know what you don’t know until you start making something. Travis says, "I'm having more difficulty with the sewers than I am with the machine itself." The real learning curve is in the transfer of existing expertise. The best way to get started is with real jobs. Start with traditional awnings and work your way toward the more complex. In time, it will eventually result in tangible speed gains, improved product quality, and significant material savings. 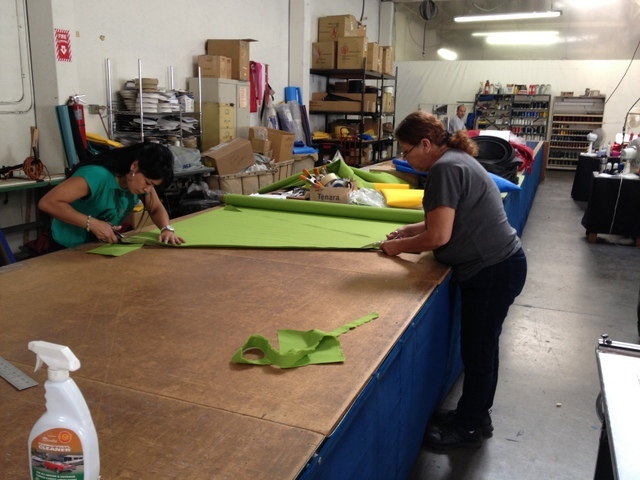 Having pre-cut parts for large awnings also reduces wear-and-tear throughout the sewing department and lets Maria more effectively manage the other sewers. OUCH my back -- no more leaning!! One person can cut large jobs instead of two! Certain awnings in LA can’t come down for re-covering because they are attached to famous buildings or lining iconic streets. Having these stored in the computer allows Academy to offer easy recovers, color changes, or simply a refreshed exterior appearance. 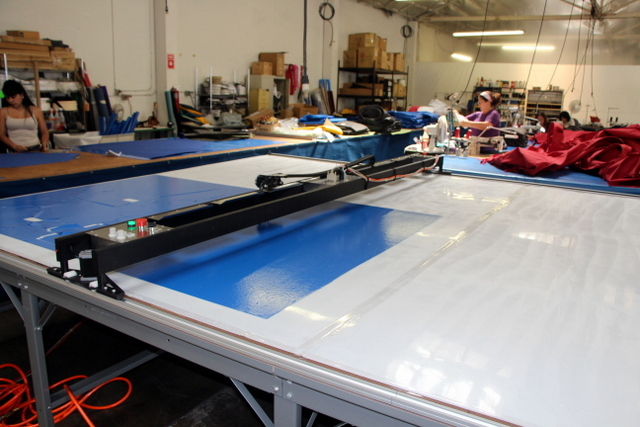 While the majority of Academy’s fabric is 47″ and 60″ wide acrylic, they’ve started seeing demand to cut wider-and-wider vinyls and shade cloth for tensile and shade structures. 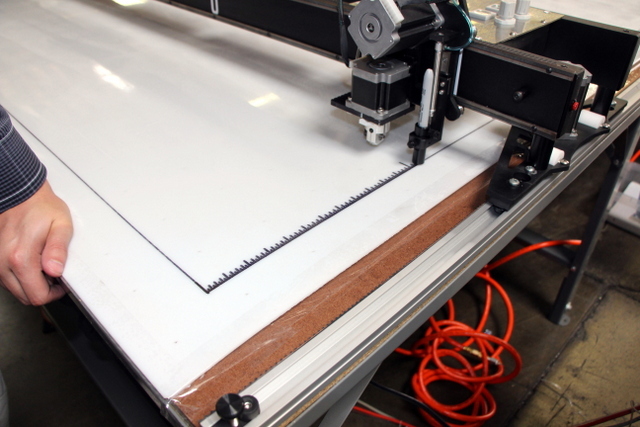 After consulting with Roy Chism from The Chism Company in San Antonio, who has been known to say “go wider, go wider, go wider”, Academy decided to get a 126″ wide plotter/cutter to plot/cut up to 116″ wide material. 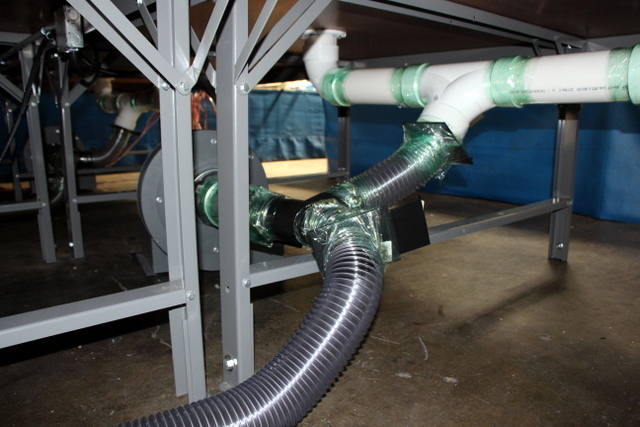 The first challenge they faced with a wider system– common to many existing awning companies — was powering the multiple vacuum blowers required to secure fabric during cutting into the existing utilities. 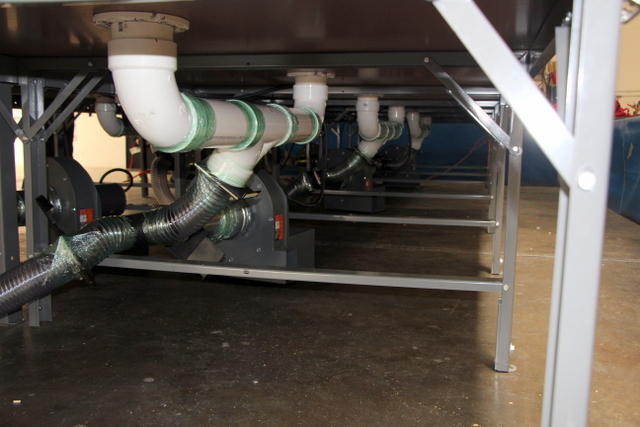 To do this for Academy, we provided six, 3HP single-phase radial vacuum blowers connected by a series of blast gates. These smaller blowers have a lower in-rush current, so if turned on one-at-a-time they can run all six blowers on an existing breaker. Each blower is mounted on it's own switch. A local electrician wires the blowers on the first day of the install. Each blower is placed on a 20 amp circuit. We designed their blower layout so it could be reconfigured based on their power budget and the type of product they are cutting. Using blast gates to close off certain sections, they can run the whole table on 3 blowers (conserve power), half the table with 6 blowers (extra suction), or one half with 3 blowers and the other half with 3 blowers (traditional). 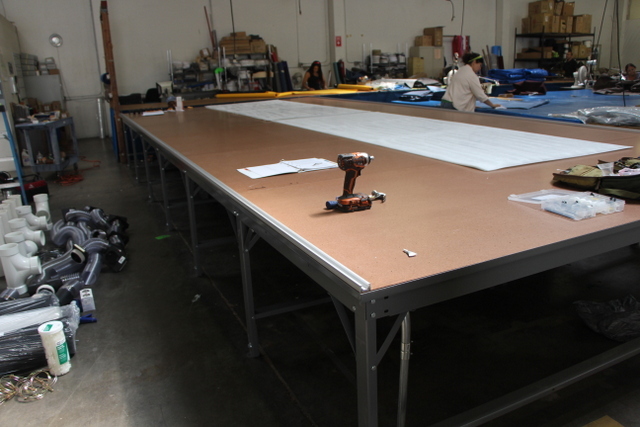 The 126″ table width is split into a 66″ section (zone 1) and a 60″ section (zone 2). 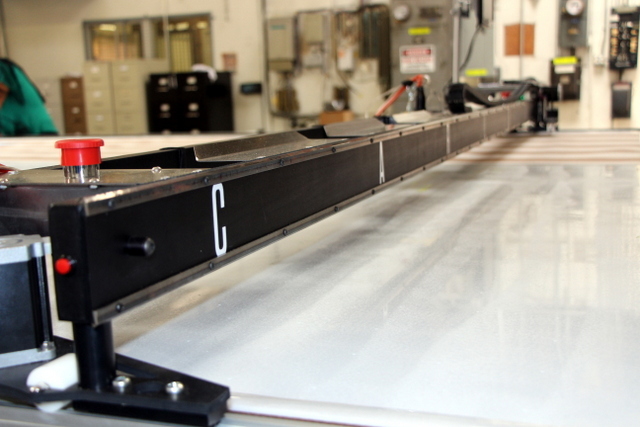 Since the 66″ section zone 1 can accommodate cutting their most common 47″ and 60″ wide goods, they can often avoid turning on Zone 2. 126" wide tables are broken into 66" and 60" wide sections. Blowers are connected with flexible and hard plumbing. Blast gates allow the blowers to be reconfigured. Making up joints with plastic wrap prevents leaks and makes them easy to take apart. We also scuffed their HDPE cutting surface with a fine grit sandpaper to increase the static coefficient of friction between the cutting surface and acrylic fabric. This makes a big difference, but only works if you are cutting material that is not prone to leaving material hangers. 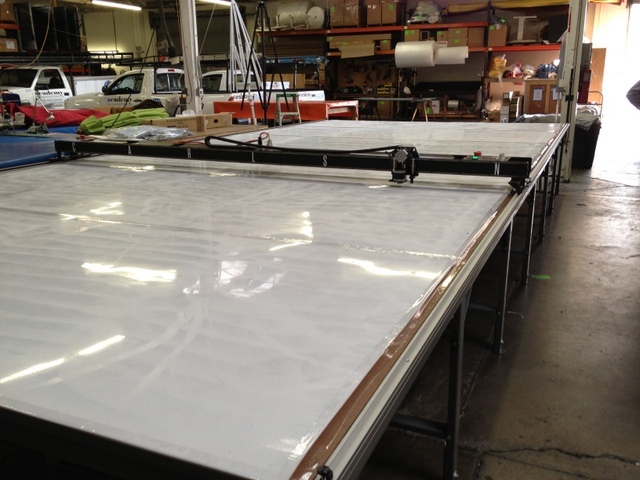 We use 120″ wide sheets of HDPE to keep cost low and limit the number of seams. Lightly sanding or "roughing" the cutting surface helps better secure the material even when the vacuum is turned off. To begin, we configured their blowers so all six were working on Zone 1. Cutting Vinyl with a 28mm steel rolling blade. Cutting letters out of Acrylic with the carbide drag blade holder. A taller frame rail makes the PTi 3x stiffer than the PT. 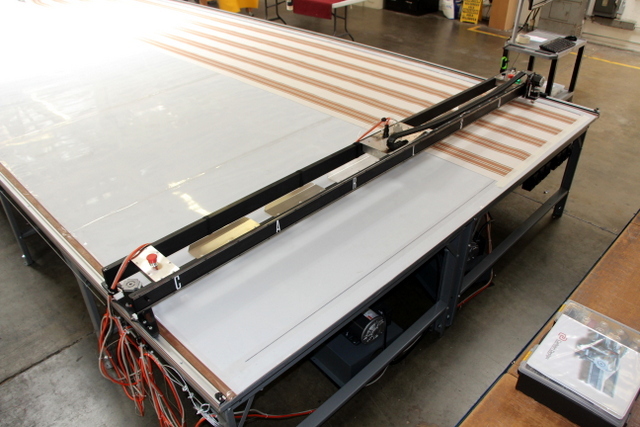 This allows wider widths so that the PTi-126" can plot/cut up to 116" wide material. Composite load wheels support the added weight from increased width. Simple backside. Cabling can be run overhead or off one side. 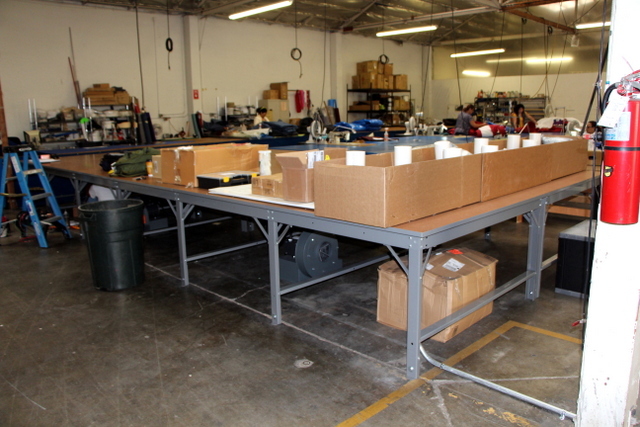 10.5'x24' working area allows for large projects! 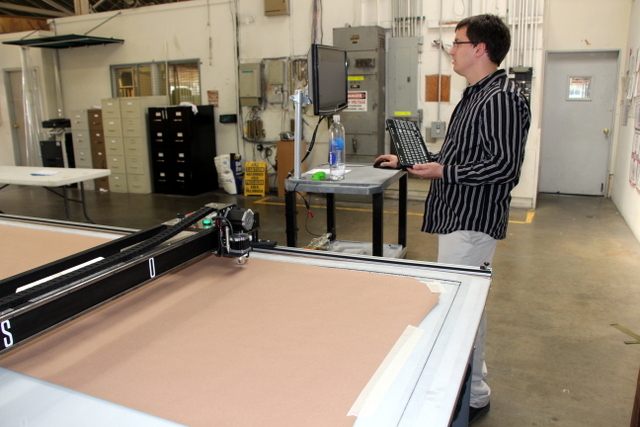 We spent three days installing and training Academy awnings team to use the Carlson Design plotter/cutter. 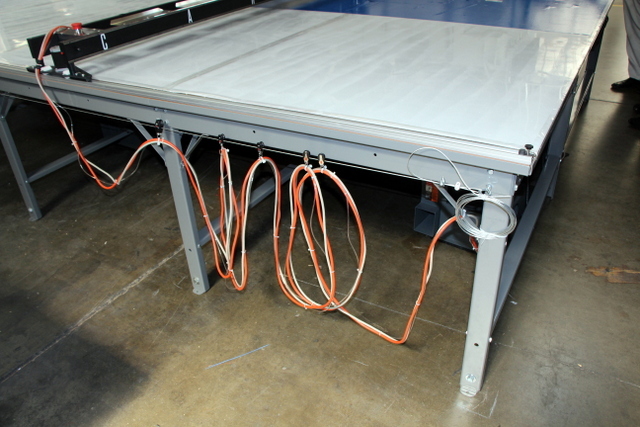 Before we arrived, they took the time to remove their old cutting table and replace it with our endless steel frame Phillocraft production vacuum table. 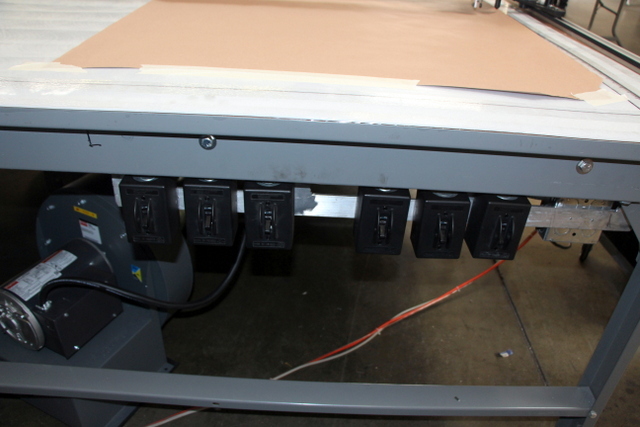 The table is easy to assemble, but takes time — having it already assembled allowed us to finish installing their plotter/cutter on the first day. We arrive. 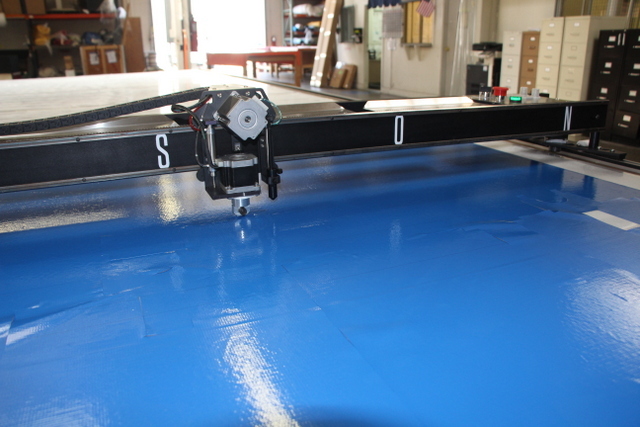 The table is already assembled and the plotter/cutter is unpacked and near the table. The cutter was opened upon arrival and inspected for shipping damage. None found. 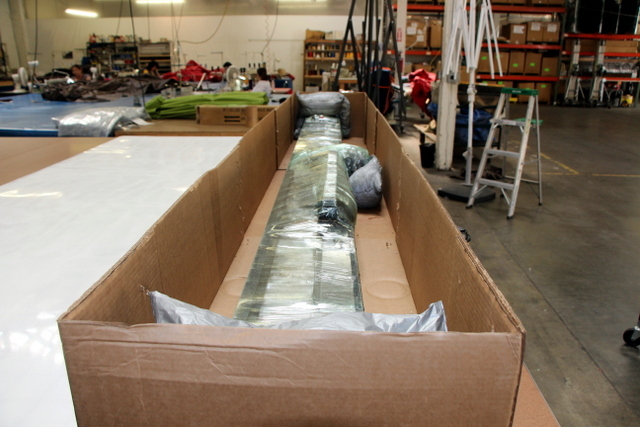 During the install, we will finish unpackaging. Assemble the operator's workstation and monitor. 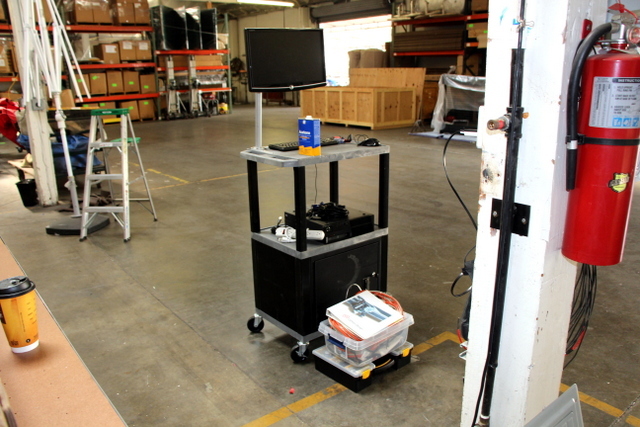 This lockable cart is a great place to store your computer, tool box, and spare parts kit. 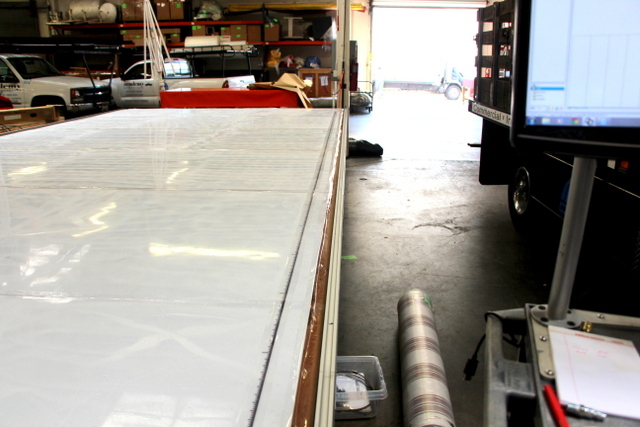 Its wheels make it easy to move when not using the plotter/cutter. 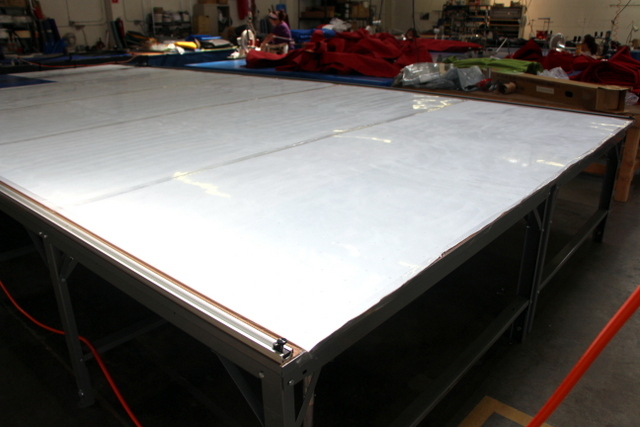 Level table and attach track. 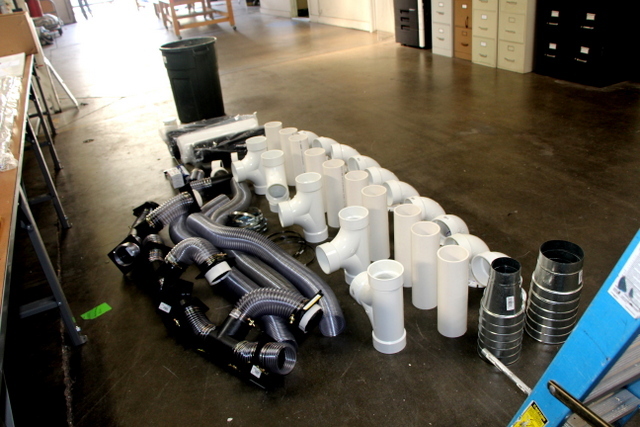 Modular plumbing is broken down for easy shipping. Flexible hosing makes attaching multiple sections quick and easy. Side mount cabling is a great way to get started. 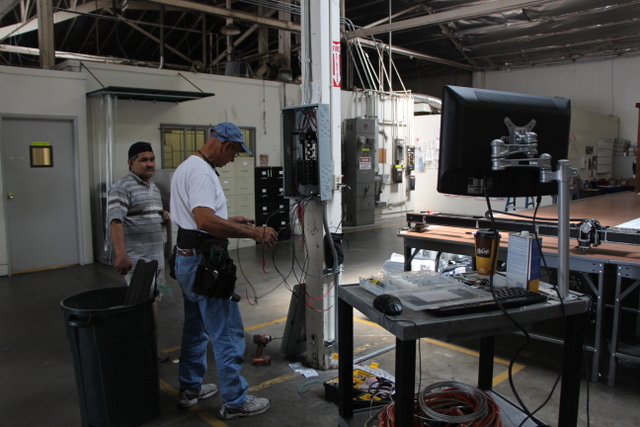 Once you establish your work flow with the table, it's easy to move cabling overhead or fix inside flexible Echain. PMU has a new feature that automatically plots a ruler down the length of your table. This is great for manually registering your material. A wireless keyboard is an easy and affordable solution for positioning your plotter/cutter. 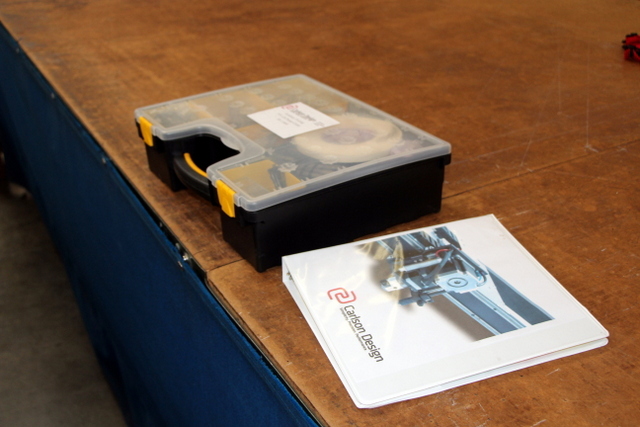 Our spare parts kit has all of the tools and parts to diagnose and service virtually any problem with the plotter/cutter. One last glamour shot. 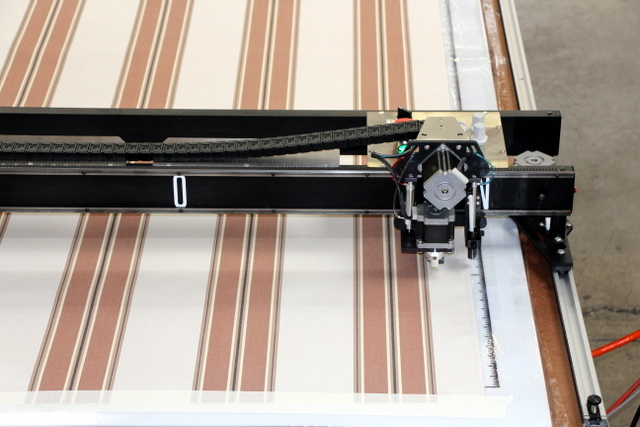 The PTi-126" plotter/cutter is a great looking system! We had a great time installing Academy’s system. Big thanks to Randy for getting the table pre-assembled. We appreciate all of the hard work from Travis, Ricardo, and Maria to start cutting real jobs on the first day of training. Finally, we were glad we had the front end support from Michael, Jim, and Alice to make automated cutting technology a priority 2013. This is a great looking setup and we look forward to seeing world class structures cut on this table.